When material fact is misrepresented to consumers by trademark infringers and/or trademark counterfeiters elements of consumer fraud are present. The Martial Art Fraud website provides information to help you learn how to identify and verify if fraud is being perpetrated by a martial arts school and then how to report the facts and activities you discover. Fact based allegations of fraud are most likely to be taken seriously and responded to by law enforcement and regulatory agencies. Legally proving fraud requires facts to support several elements of proof and we discuss some means you can employ to determine if elements of fraud are present. Lets get started. Federally registered trademark owners are the exclusive source for their products and/or services and only the trademark owner regulates and controls them to their standards. You may recognize some of the famous registered trademarks of brands shown below. Trademark infringers use spurious marks or registered trademarks without a license from the trademark owner in a dishonest manner calculated for advantage by confusingly suggesting, implying or otherwise representing by commission or omission that they are associated with, affiliated with, licensed by, approved by, endorsed by the trademark owner and that they are the source for things which they are not. The Martial Art Fraud website shows you how to factually verify if any of these types of fraud are occurring. Trademark infringement by a martial art school may be occurring in full view of the world when you see registered trademarks displayed on web pages, signage, promotional literature, application forms, contacts, business cards, banners, flags, rank certificates, etc. ; however, the infringer does so without a license from the trademark owner and counts on prospects failing to conduct any due diligence before enrolling. The Federal government has passed stringent laws including The Lanham Act, The Trademark Act of 1984 and the Anticounterfeiting Consumer Protection Act of 1996 and more recent laws plus activated additional government agencies in the battle against Intellectual Property crimes. Trademark infringement violates federal statutes 15 U.S.C. § 1051, 1114, 1125 which is an act punishable by civil and criminal penalties. Trademark infringers use spurious marks or registered trademarks without a license from the trademark owner in a dishonest manner calculated for advantage by confusingly suggesting, implying or otherwise representing that they are approved by, endorsed by, associated with, licensed by, or somehow affiliated with the trademark owner or that they are the source of things which they are not. Trademark counterfeiting violates federal statutes 15 U.S.C. § 1114, 1116, 1117, 1127, 18 U.S.C. § 2320 and is an act punishable up to a felony federal criminal offense. 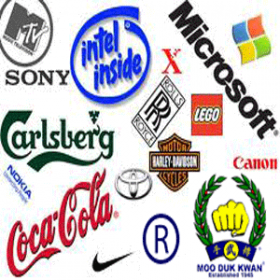 Trademark counterfeiters affix spurious marks or registered trademarks to products or services without a license from the registered trademark owner or copyright owner and produce and/or distribute their products, services or content in a dishonest manner calculated for their advantage by representing they are the source for things which they are not. Trademark counterfeiting conspiracy is trafficing in trademark counterfeits by multiple parties in violation of federal statutes 18 U.S.C § 371, 2318 & 2320 and is an act punishable as a federal criminal felony offense for all involved parties. Trademark counterfeiting conspiracy is present when multiple parties such as martial art vendors or instructors at different schools traffic in trademark counterfeit items, such as patches, flags, banners, rank certificates, etc. 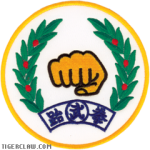 Consumer fraud in martial arts may begin with deceptive signage or advertising featuring registered trademarks that are not licensed for use by the martial art school and/or verbal misrepresentations by the martial art instructor about registered trademarks that they are not licensed to use. Trademark infringers and trademark counterfeiters play upon the registered trademark owner's public identity (their registered trademark), their reputation and the substantial goodwill associated with their trademark in order to induce prospective new students to enroll. A prospect's reliance on initial misrepresentations of material fact by a martial art instructor and the prospect's justifiable reliance on the martial art instructor as the expert in the transaction may result in a prospect undertaking a course of action based on fraudulent circumstances and in some cases even signing a multi-year tuition contract with the martial art school, thus resulting in student fraud that can continue for years. Because his scheme was so well concealed he got away with defrauding thousands of consumers out of billions of dollars from 1960 until 2008 before his fraud scheme was discovered. Because martial arts fraud may be perpetrated for extended periods of time on students, the length of time that a martial arts instructor or martial art school has been in business may not always be an effective indicator of legitimacy. So how can a consumer know with factual certainty if web pages, signage, advertising, literature, verbal representations, etc. are fraudulent? The first element of fraud is present when a false statement of material fact occurs. When you document that a martial art school has used registered trademarks without a license from the trademark owner, then you have proof of false representation of a material fact. Trademark infringers may be bold with their infringing activity because they count on consumers “trusting” them and/or the trademark brand names and logos that are displayed in relation to the products or services being sold and they count on consumers NOT performing any due diligence. 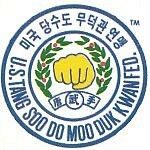 Martial art school web pages, signage, advertising, literature, verbal representations, etc. are intended to attract prospective new students and may feature the registered trademarks and logos of well known martial art schools or registered martial art system names in order to attract new prospects to the infringer's business. With only a few key pieces of information you may quickly determine if certain types of fraud are present. When you have identified registered trademarks in use, then you can confirm whether or not the martial arts school or instructor displaying them is licensed by the trademark owner to do so. You can then use the links below and search through 3rd party references and/or government references to discover if any of these, or some portion of them, are registered trademarks and if the martial art school is licensed by the trademark owner. If any of these appear in your search results, or some portion of them, then you can verify the trademark owner’s name and compare it to the martial art school name and/or consult the registered trademark owner’s licensee list to learn if the martial art school or instructor is an active licensee of the trademark owner. Federally registered trademark owners are the exclusive source for their particular products and/or services and only the trademark owner regulates and controls them to their standards. Information is presented to help you understand how you can protect yourself BEFORE you become a victim of fraud which is a much better strategy than seeking a remedy AFTER you have been defrauded. We support the rights of consumers to be free from deception and fraud, particularly as perpetrated by those who infringe trademarks and thus the trademark owner's public identity (their trademark), their reputation and the substantial goodwill associated with their trademark and those who employ counterfeit trademarks in relation to products or services in order to attract, confuse, deceive and defraud consumers. After these due diligence steps of fact checking, you will be better prepared to protect yourself from fraud. The following are just a few registered trademark examples provided for illustrative purposes and each registered trademark belongs to the respective owner who reserves their rights. The Martial Art Fraud website provides direct links to a number of different reporting agencies dedicated to protecting consumers from fraud and criminal activity. If you discover any registered trademark owner's marks are being used illegally in your community we encourage you to report it. A martial art school engaging in fraudulent representations typically tells the consumer that they can provide students with training in a well known or famous trademarked martial art system and they tell the potential student (or parents) that the student can earn legitimate certificates of skill and proficiency in that trademarked martial art system by training with them at their school. They may even tell the student that their rank certificates will be issued by an impressive “sounding” national or international martial art organization. Misrepresentation of material fact to a consumer may be employed as an inducement to encourage a prospect's enrollment at the martial art school. This particular deception of the consumer is analogous to the martial art instructor telling a prospective student that they can earn legitimate certificates from a well known university (like, Harvard®, Yale®, etc., or any other trademarked educational entity) by training at the instructor’s school. Such claims or assertions made to consumers regarding a trademarked martial art school/organization or a trademarked martial art system that the studio or instructor is not licensed to use are false and fraudulent. 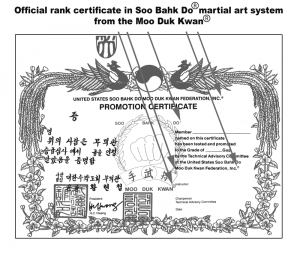 Exhibit 1 is an example of legitimate rank certificate issued through one of Hwang Kee's licensed Moo Duk Kwan® schools. 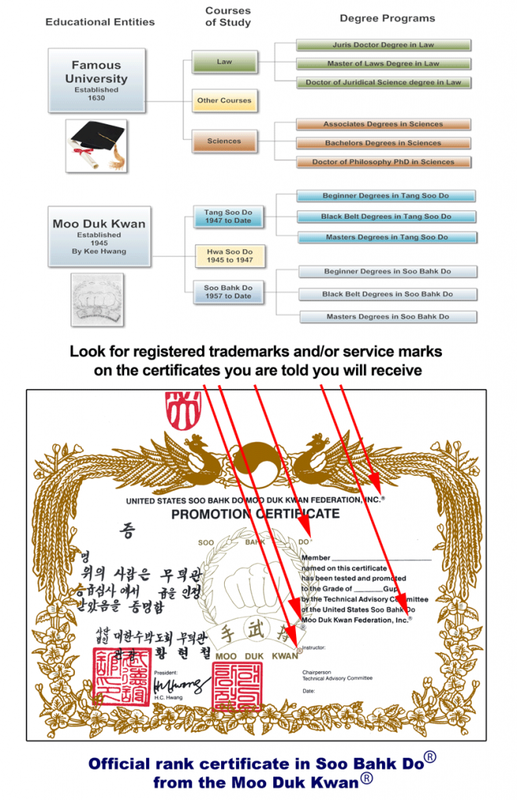 Only the elements on the certificates that are registered trademarks or logos warrant your scrutiny for the purpose of quickly determining if the martial art school is engaged in trademark infringement and/or trademark counterfeiting. If multiple schools or instructors are involved in the distribution of counterfeit items, then trademark counterfeiting conspiracy is present and is a punishable federal felony criminal offense for all parties involved. When considering a martial art school, ask the instructor or staff member if you can inspect a sample certificate that is issued to students at the school and then look for identified Federally registered trademarks and/or service marks. However, be aware that a counterfeiter may use registered trademarks with or without proper designation. Other unregistered marks and logos may also be used in commerce as a trademark by a specific entity and if not federally registered they may be identified by: TM or in some cases nothing at all. Regardless of the presence or absence of trademark symbols, you can still verify the owner of a registered trademark and by doing so you can identify fraudulent activity before you become a victim. 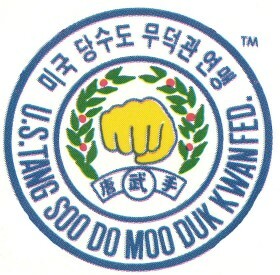 This due diligence process can be as simple as confirming the exact legal martial art school name, martial art system name and/or martial art school/system logo and then searching an online database to determine if any are registered trademarks and if the martial art school has a license from the trademark owner to use the name or logo you see displayed. Most often martial arts certificates are issued to students as evidence of the skill and proficiency achieved by the student studying a particular martial art system name in a particular martial art school name. The school name and system name may or may not be a registered trademark. However, inspecting a certificate for the presence of registered trademarks and if nay are present, then verifying if the martial art studio or instructor has a license from the trademark owner is one means that a consumer can factually discover and document fraudulent circumstances and take action to protect themselves from becoming a victim of fraud. When inspecting the certificate do not be concerned with other design elements featured on the certificate and/or any foreign language displayed on the certificate, instead look for the recognizable words or logos identified as federally registered trademarks or service marks on the certificate. You will need this information later to determine if the school or instructor is in fact licensed by the trademark owner to use those federally registered trademarks and/or logos. The ABSENCE of trademarks or trademark registration symbols( ® TM © ) on signage, literature, certificates, etc. does not necessarily have negative connotations; however, the PRESENCE of identifiable trademarks allows you to verify important key facts about the business. Whether of not the martial art school is party to trademark counterfeiting conspiracy which is a punishable federal felony criminal offense for all parties invloved. From these key findings you can deduce other conclusions about the nature of the martial art school and the character of the instructor. Note: The mere presence of a registered trademark symbol ( ® TM ) on a martial art school's web pages, signage, advertising, literature, in verbal representations, on certificates, etc. does not mean the martial art studio or instructor is licensed by the trademark owner. Any or all of these uses may be without a license from the trademark owner which constitutes misrepresentation of material fact. Patches, banners, certificates, etc. bearing spurious marks or registered trademarks without a license from the trademark owner are counterfeits. However, once you have identified the marks and/or logos affixed to a patch, banner, certificate, etc. and verified if they are registered trademarks, then you can verify the trademark's owner's name and determine if the studio or instructor is licensed by the trademark owner to display them. 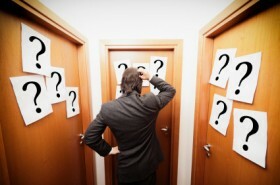 During your due diligence and verification process, should you discover that the studio is a licensed representative of the trademark owner, then you know that the training you will receive and the certificates you will receive and what they stand for and represent are regulated and backed by the registered trademark owner. However, should you discover that the studio or instructor is NOT licensed by the trademark owner, then you can prove factually that the patches, banners, certificates, etc. are counterfeits. Should you determine the martial art school is not licensed by the trademark owner, then any credentials and other items you would receive from them bearing unlicensed trademarks will be counterfeits. In light of discovering factual evidence of fraud before having enrolled, it is prudent to ask yourself what else you may be deceived about should you choose to proceed with enrollment at that particular studio with that instructor. 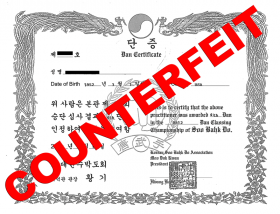 Some consumers seem eager to own counterfeit products instead of authentic originals as is evidenced by the burgeoning trade in counterfeit college and university diplomas, clothing, purses, watches, DVDs, etc. However, if you want to receive legitimate training regulated by a trademark owner and legitimate credentials and certificates in return for your efforts and payments, then the information on the Martial Art Fraud web site can help you learn how to protect yourself from martial art fraud and help you understand how to tell if you will be receiving authentic training and legitimate rank certification.